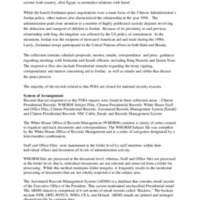 This collection consists of records related to United States relations with Jordan in 1994. The signing of the peace treaty between Jordan and Israel, on October 26, witnessed by President Clinton, was the highlight of the U.S.-Jordan relationship that year. Jordan benefited from American aid and trade. 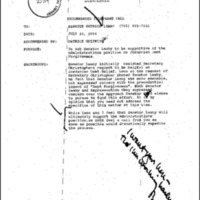 The records in this collection include memorandums, emails, correspondence, cables, and Presidential remarks.